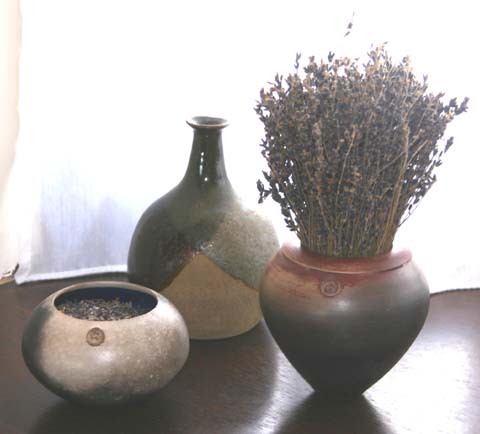 In March 2010 I found some old photographs of four of my pots. These are at the bottom of the page. Cornwall Technical College, where I did my two years of teacher-training between 1969 and 1971, included Redruth School of Art, which had a phenomenal craft potter’s course. 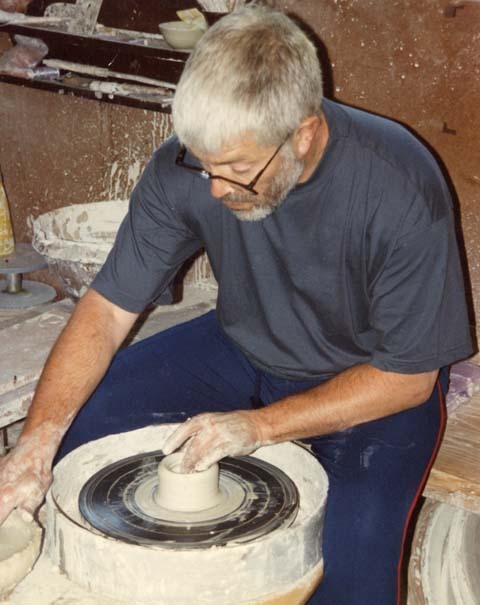 As a teacher-training student I got a little bit of ceramics - very little, from my point-of-view. 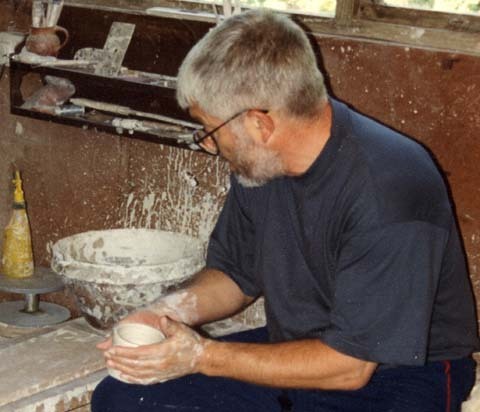 However, I was fortunate enough to make friends with Hugh West, one of the ’real’ pottery students, who helped and encouraged me tremendously as I got very heavily into pottery. I built my own kickwheel and primitive paraffin-fired kiln, and experimented with all the amazing minerals which the Cornish tin-mining industry had brought to the surface over the centuries. I continued the interest at The Curnow School, designing and building a top-loading electric kiln (even winding my own elements!) but later buying a ’real’ front-loading one. Hugh taught me more in a few evenings than our tutor did in the whole two years of my course. 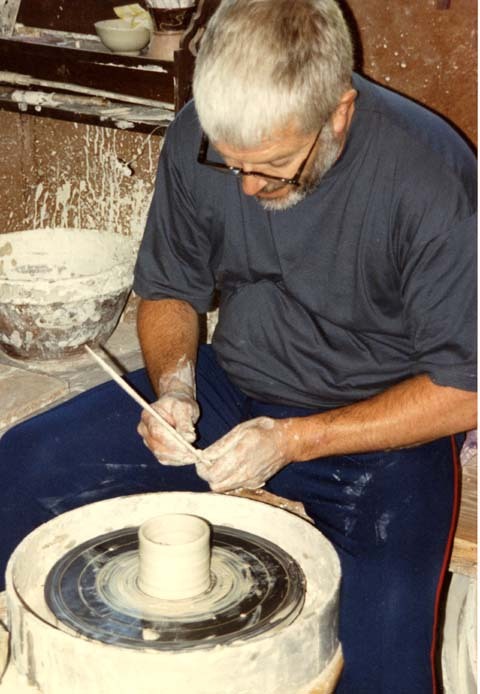 He was a fabulous thrower who was generous in sharing his skills with me. 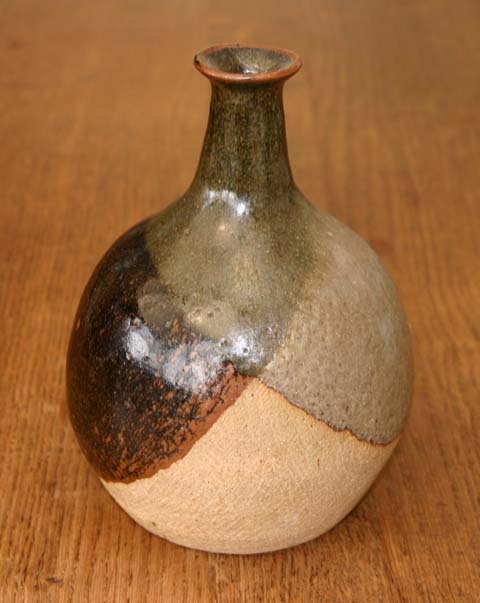 This stoneware bottle is the only pot of mine that hasn’t been lost, broken or left buried in a box we haven’t unpacked since we moved from Derby in September 2005. 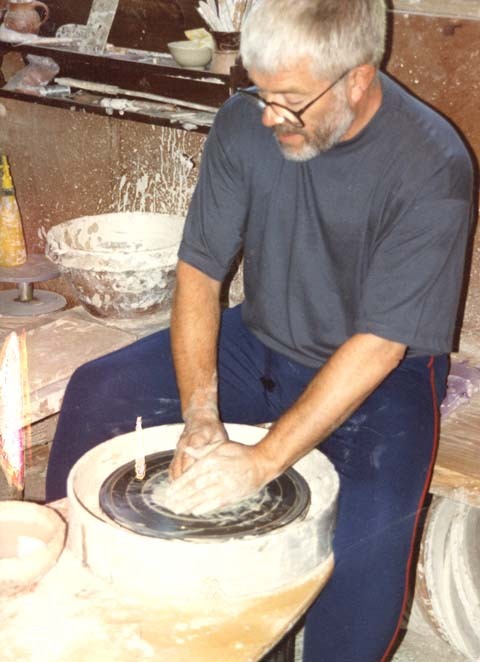 It was thrown on my home-made kickwheel using a rough stoneware body supplied by Bill Doble, a farmer in St Agnes, Cornwall, whose land contained a large deposit of fireclay. He blended this with a highly plastic ball clay from English Clays in St Austell - using an old corn mill belt-driven from his tractor! 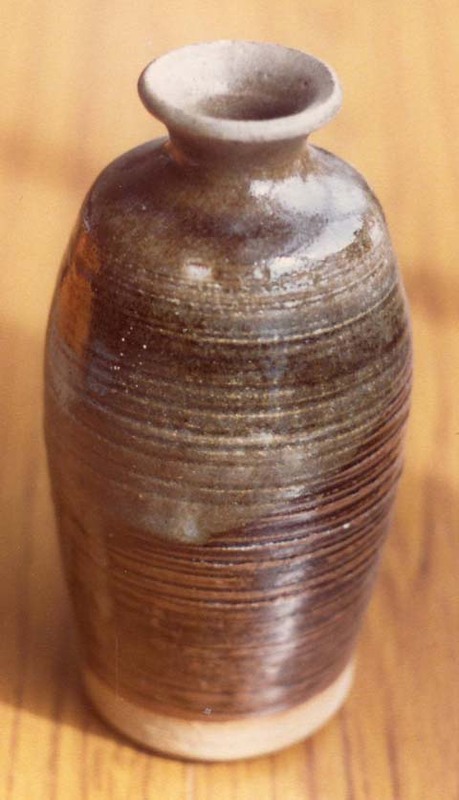 The bottle (always a difficult shape to throw) was scraped with a sawblade to roughen the surface - and probably to hide the fact that it wasn’t well-enough thrown to leave as it was! - and cross-dipped in commercial oatmeal and tenmoku glazes before being high-fired in the electric kiln I bought for school. 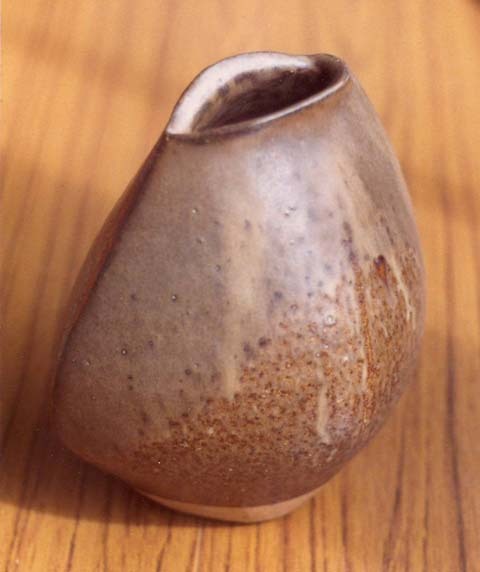 This is an excellent result from an electric kiln - particularly the black tenmoku breaking to rust. 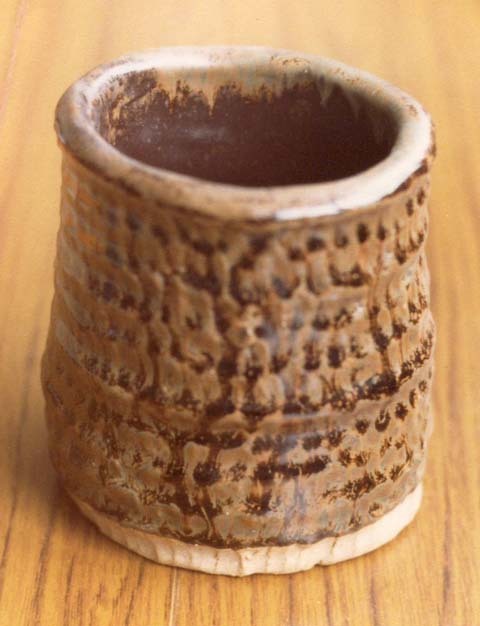 Sadly Brookside School in Derby had no facilities for pottery so, like so many of the pursuits I had enjoyed, this one slipped away from me. I even left my precious kickwheel behind at The Curnow School. 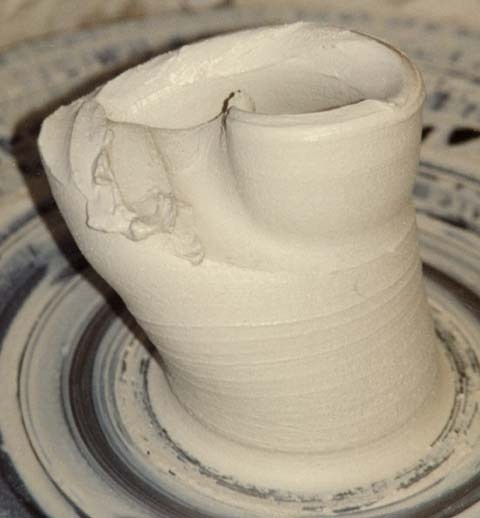 In 1996 I tried another evening class in Derby - really in the hope of meeting women after Wife Number Two departed - but after years of high-fired stoneware I didn’t take to crummy earthenware. Before that, though, I visited my old friend Hugh at his pottery in Cornwall and had one wonderful day throwing on his brilliant little Japanese electric wheel. 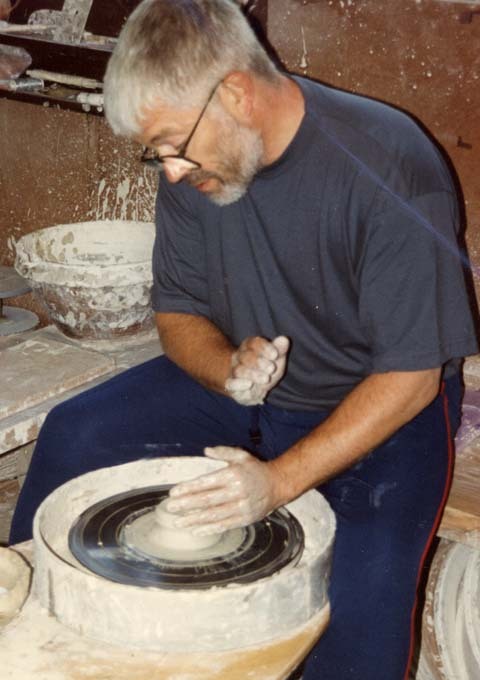 In June 2009 I found the photographs Hugh took of me attempting to throw pots, ten years after my last encounter with a wheel. Would I still be able to centre the clay? I’m not telling you how long it took to get this on centre! Getting the pot into shape. That’s the base trimmed up! Safely lifted off the wheel! All this throwing - and pulled handles too! One of the ones that got away! I found out from the Glasshouse Gallery website that Hugh had moved back to France, where he had worked in the 1980s. Specifically to La Borne, near Bourges. I managed to find a rather terrible website for the village with an embryo home-page for Hugh. Then, having already tried to send Hugh an email via the village webmaster, I discovered that he had his own website - www.hughwest.com. 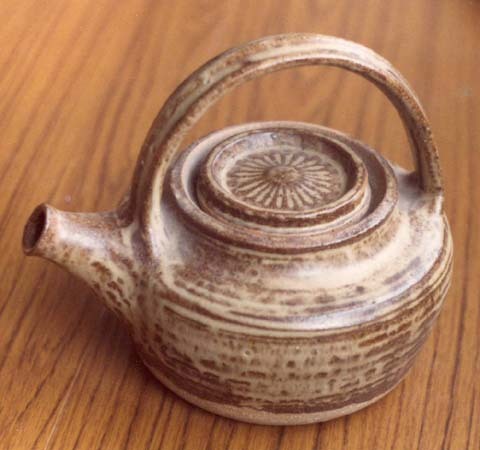 This included a gallery of his amazing raku, of which I have two early examples bought at the Glasshouse Gallery in 1995 (below) but which had obviously moved on amazingly before he had to stop making raku on health grounds, and some truly stunning stoneware. He later launched a completely revised site at the same address, designed by his son James and with a vast gallery of ceramic work, as well as some superb photographs. Please visit to see the stunning raku, stoneware and porcelain pots he’s been making over the past few years. The glazes are astonishing, and the quality of Hugh’s throwing just blows my mind (though I’m not too sure about the wooden handles on some of the pots!). I can’t understand why he isn’t better recognised. Please also have a look at Hugh’s and Christine’s blogs. behind the gorgeous raku pots which I bought in 1995.
until Patricia clears out last year’s lavender! A coiled pot, originally more-or-less circular in section, beaten into a quite-extreme shape when leather-hard, using a wooden bat. Oatmeal glaze overlaid with another unidentified one. Unquestionaly my most ambitious single pot, with the main body, the lid and the spout thrown on my home-made kickwheel and a very difficult pulled handle (I have no idea how I prevented it from sagging, either while drying or in the kiln - you can see why the Oriental potters adopted bamboo handles!). Commercial oatmeal glaze. The pattern on the lid was done with the controlled (eventually) chatter of the turning tool.